When most people think of moving, they typically think of packing up the contents of their home or building and moving to a new structure. 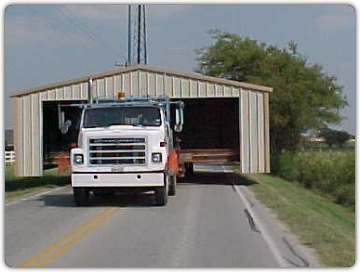 Well, did you know that Just Right Transportation can actually move your entire home or building too? 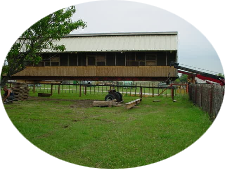 Structure moving has been around for over a hundred years, and is considered the most environmental and economical choice for dealing with a building that needs to be moved, or removed, from an existing location. We use the most up-to-date house moving equipment along with applying the latest in house raising and moving methods (the Unified Hydraulic Jacking System and remote controlled house moving dollies) in order to enable us to safely and securely move your structure without causing damage to it. In many cases, we buy old buildings and resell them as a way to promote the use of recycling buildings rather than demolishing them. View our current inventory to see if we have something that fits your needs. Please, take a look at our for sale page. As active members of the Texas Association of House Movers, we continually strive to educate ourselves on new technologies as industry standards continually change to meet the construction needs of tomorrow. Learn more about what we can do for you below. 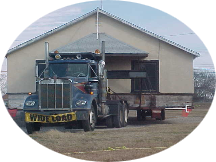 We specialize in transporting both large and small structures, whether they are buildings, houses, or mobile homes. 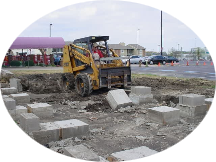 We can provide lifting, re-leveling, and reseting services on your existing building or structure. We provide demolition to remove an existing structure from your property, or prepare for the arrival of another.